New Zealand’s Iron helmet (known as the Spanish helmet). New Manukau Harbour helmet. Open letter to Te Papa Tongarewa. Re: The “Iron helmet” (known as the Spanish helmet); Item Registration Number: ME00084. Congratulations on your outstanding museum – it certainly is a “house of treasures” and it is in respect of one of those treasures – Wellington’s ‘iron helmet’ (also known as the Spanish helmet) that I write to you. Let me introduce myself. My name is Winston Cowie, author of Conquistador Puzzle Trail, which comprehensively and objectively assesses early Spanish and Portuguese voyages to New Zealand and Australia pre Tasman and Janzsoon. It also presents details of New Zealand’s ‘oldest’ shipwreck, a likely Dutch vessel. Praised by both the Portuguese and Spanish embassies to New Zealand, Conquistador Puzzle Trail takes the reader through each Iberian puzzle piece, puts the arguments for and against its antiquity to the reader, and encourages the reader to decide what part of the Conquistador Puzzle that piece forms. Each puzzle piece is presented to the public on its own merit; I explain how I came across it, what or who is the source of the puzzle piece, and let you decide where it fits into the theoretical framework. If a puzzle piece doesn’t fit, it doesn’t fit; I have not tried to twist a puzzle piece to fit with a theory. Each puzzle piece is what it is and means what it means. Which brings me to that treasure in your collection, the “Iron helmet”. Having reviewed the commentary on your website in respect of the helmet, commentary that is based on a 1983 paper entitled “The myth of New Zealand’s so-called Spanish helmet”, in my humble view, it may be an opportune time to review that commentary. It has been 33 years! I have taken the time to consult with the author of that paper, who agrees that some of the theories in that commentary may need revision. “An iron helmet dated to 1580 and previously thought to be Spanish was found in Wellington Harbour some time before 1904. It has since been repeatedly cited as evidence of European contact with New Zealand prior to Abel Tasman in 1642. It is a ‘close helmet’. Though the style is European, it is not necessarily Spanish. It could have been made in England or northern Italy. Its state of preservation suggests it was immersed in seawater for only a short time. It shows no signs of marine encrustation, although it could have been cleaned. Archival material in the Museum shows that so little is known about the helmet that it cannot be used as evidence of European contact with New Zealand before Tasman. The helmet may have been used as ship’s ballast – obsolete armour was often used this way. It may have been a souvenir brought out by an immigrant. The helmet may have also been given as a presentation piece or as trade to local Maori in much the same way as armour was presented to Hongi Hika, Titore, and a sword to Te Rauparaha. The helmet was first recorded in the museum’s collections in 1904 – 1905. It has been dated to approximately 1580 and is of a type known as a close helmet. Close helmets were used in the sixteenth century. There is no evidence to suggest Te Papa’s helmet is actually of Spanish origin. It is not known when or how the museum acquired the helmet. It was recorded as “found in Wellington Harbour”. I humbly propose that the three explanations theorised in respect of the helmet back in 1983 may require your kind consideration for amendment. I provide an assessment of those theories below, with some excerpts from Conquistador Puzzle Trail included. 1) The helmet could have been used as ship’s ballast. “This theory is in the author’s view simply no longer credible. Ballast is used to provide stability to a ship and as such, is required to be heavy and generally uniform in size. In my view, a post-Cook era sailing ship using a circa 200-250-year-old sixteenth century iron helmet as ship’s ballast is as almost as far-fetched as one can get in attempting to explain why the helmet was likely discovered in Wellington Harbour (I say likely, because of the uncertainty around the circumstances in which it was allegedly discovered). There is more in Conquistador Puzzle Trail but I think you get my drift. Perhaps it may be time to move on from this theory in respect of Wellington’s iron helmet. 2) Just as the Maori chiefs Hongi Hika and Titore were presented with some armour, and Te Rauparaha was given a sword, so too the helmet could have been given to a Maori as a presentation piece, or as a trade, and lost some time later. Furthermore, if Wellington wasn’t settled until the 1840s, there isn’t a lot of time for the Maori chief to receive it, lose it in the harbour, and then it be discovered by 1904 – and none of this be recorded in the oral tradition of the area. There is nothing to support this theory – a Maori chief being gifted a 250 year old helmet, who then lost it in Wellington Harbour. Perhaps it may be time to move on from this theory in respect of Wellington’s iron helmet. 3) It may have been a souvenir brought out from England by an immigrant. Of the three theories suggested on your website, the theory that the helmet was a souvenir brought out from England by an immigrant is the most credible, however, is still problematic. “The theory has recently been supported by the finding of an article in the Dominion Post (3 August 1932) stating that a first generation New Zealander, Alfred Taine, wrote that a settler of the 1840 era purchased the helmet prior to leaving Gravesend in London. “On his arrival here he learned a helmet was quite unnecessary, and as he was sufficiently encumbered with his goods and chattels, and not any of his fellow immigrants cared to accept the iron hat, so he got rid of it in the most easy way – by tossing it overboard. Now, having assessed the three theories currently used to explain the helmet’s existence, I propose alternatives which are based on some context – more information has come to light since that 1983 paper. My proposed alternative commentary follows. The “Iron helmet “(known as the Spanish helmet); Item Registration Number: ME00084. “An iron helmet of European origin was presented to the Museum of New Zealand circa 1904-1905; it is thought to have been found in Wellington Harbour and it dates to the years 1560-1580. The helmet is an international type of helmet; a standard model to be found anywhere from England to Spain to Portugal to Italy where large numbers of these helmets were produced during that time period. The most important thing to consider when assessing the helmet’s origin is the uncertainty surrounding where it was found and the lack of detail on the museum catalogue in respect of its origin. The lack of any other artefacts discovered with the helmet also leaves a blank canvas in which people can only theorise as to how the helmet ended up in the museum. There are three theories that have been proposed in respect of the origin of the helmet – two in respect of pre-Tasman Iberian voyages to New Zealand that may have occurred and one in respect of a later immigrant who lost the helmet in the harbour. If one assesses the era that the helmet dates to, the late sixteenth century, it was the Spanish and Portuguese who were the maritime powerhouses at that time, both of whom had bases in South-east Asia and the Spanish in South America. In respect of the Spanish, a Spanish voyage by Captain Juan Fernandez is accepted by Spain’s national Naval Museum in Madrid as having occurred between 1576 and 1578, sailing to and from Concepcion in Chile; a later letter claims that on that voyage Fernandez discovered islands in the Pacific; the helmet dates to that same period -1560-1580; there is Maori oral tradition from the Wellington region of a pre-Tasman voyager having a child with a Maori woman; and the Ruamahunga skull – of a European woman living in New Zealand in the sixteenth century dates to within 41 years of that voyage. When these ‘conquistador’ puzzle pieces are put together, it can be theorised that the helmet may indeed be ‘Spanish’, as was originally theorised. An alternative Iberian theory is that while the helmet has been dated to that 1560-80 period, it may be earlier and have come off an earlier Portuguese voyage to New Zealand and Australia – that of Captain Christopher Mendonca, the sixteenth century Dieppe maps of which suggest that he was probably the first European to discover Australia and New Zealand between 1520-1524. Similarities have been claimed between the Wellington helmet and those in the Lisbon Military Museum. What do you think? They are all reasonable explanations and all with supporting context, as opposed to, in the case of the ballast and Maori chief gifting, dare I say it, nothing at all. “The negative conclusion of my paper does not stand up any longer. However, from the point of view of what information was available at the time in the National Museum archive, my paper is still the major reference for the ‘Spanish’ helmet. So you could say that what does not stand up is my interpretation of the facts at that time. I have no qualms about changing my mind if I am proved wrong or if additional evidence comes along. Back in 1983 I certainly held strong views about any pre- Tasman exploration of New Zealand because there was no evidence for it. There was another reason for my entrenched attitude, too. The subject was being spoiled by people claiming bizarre discoveries of New Zealand by Arabs, Phoenicians, Celts etc and several of us were trying to take the subject seriously. 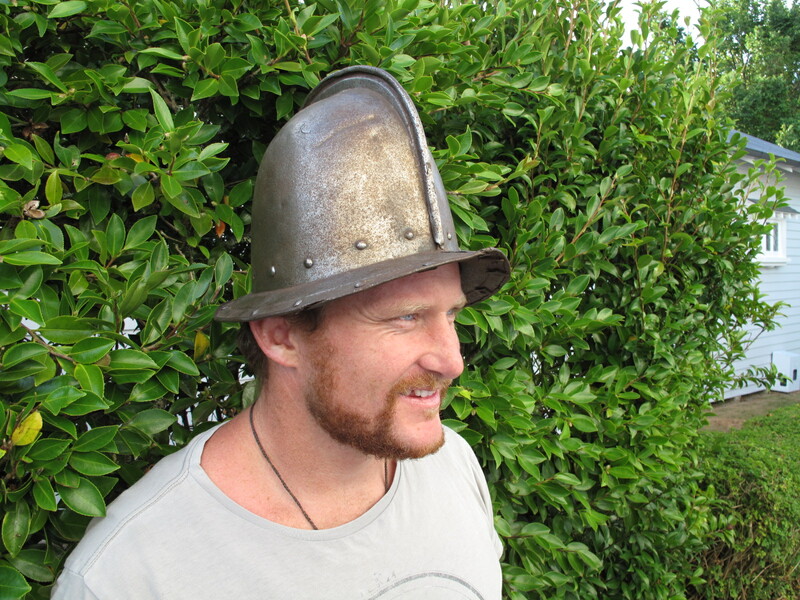 So my paper was aimed at being as definite as possible to try and bring some sensibility before the public – what did we really know about the helmet and was it evidence for a pre-Tasman visit to our shores? I found, of course, we knew nothing about the helmet – other than what I wrote – and since then we still don’t know any more. I would be incredibly grateful if you would take the above into consideration and reconsider the museum’s commentary in respect of the helmet. Should you need any further information, may I propose you read Conquistador Puzzle Trail, which is available in Paper Plus stores around New Zealand and all good independents. There are an additional 33 puzzle pieces within it that have been assessed to see where they may or may not fit within New Zealand and Australia’s discovery framework. Winston Cowie and the Manukau Harbour helmet. I look forward to hearing from you, and perhaps even seeing a change in the commentary re this national taonga.